I've been thinking more about yesterday's blog post about "Alien Evolution," and came to conclusion that the aliens might not be changing at all. So, sure, this alien abduction researcher can point to evidence showing that aliens used to abduct humans in isolated outdoor areas back in the '60s and now they abduct people right from their bedrooms, and the aliens used to wear snappy uniforms and visor caps in the '60s and now they treat our planet like it's one big nudist colony... but what if the only thing that's changed is our perception of the phenomenon, not the phenomenon itself? Is it too Freudian to wonder why people in 2011 experience naked beings invading their bedrooms and kidnapping them? And, oh yes, probing them? Maybe that's oversimplification, but it's true that what makes humans insecure changes over time. 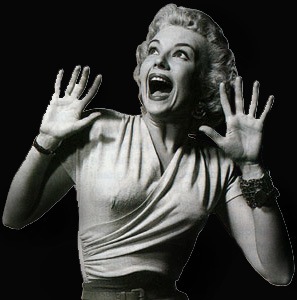 We had different nightmares in the 1960s than we do in 2011. Why wouldn't our perceptions of a threatening alien encounter change over the course of five decades? The end result is the same: the abductee feels completely powerless.